Music and friendship don't always make for the best relationship, but Preston band The Capital make it look like child's play. The band emerged from prominent band Failsafe following the tragic loss of guitarist and vocalist Matthew Cogley in early 2015. And they have been making huge strides ever since. Remaining members Andy, Rob and Simon were joined by renowned singer/songwriter Seamus McLoughlin and Nik Taylor (previously of Next Stop Atlanta) on guitar, and the band have now started to create their own identity with a brand of visceral/melodic rock reminiscent of Pearl Jam and Hot Water Music. Recharging his batteries on a sailing trip in Croatia, Seamus took some time out to talk about the band and the exciting prospect of a new EP to be launched later this month. When asked how the band came about and their particular style of music, Seamus explained: "Andy, Rob and Simon used to be in Failsafe and we got together a couple of years ago after the band kind of finished what they were doing, and after the loss of Matthew Cogley, who was a big part of Failsafe. "They were still jamming, still making music and they knew I was a singer. We were hanging out as pals and so I said: 'Do you maybe want me to help you out for a bit, until you find someone?'. And that has turned into a long-term thing, which I'm really enjoying. "We've got quite a noise about us, because we've got three guitars, bass, drums and four vocal, and so it's melodic but quite in your face. "You might only hear that live, but I think music of that style should be delivered that way. We all like punk, the Seattle sound, just good solid melodic rock music really." 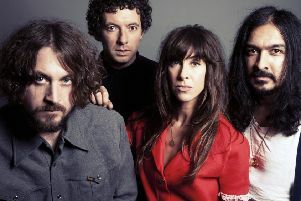 Having already had one successful EP, Hummingbird, under their belts, The Capital recently found time to return to the studio. Seamus said: "We set to work with producer Pete Miles down in Devon and released the Hummingbird EP not last year, but the year before. We got back into the studio again with him recently and recorded another EP with him, which is called This Place Matters. It has five brand new songs on it and we are really excited about it." But how did This Place Matters come about? "In a band like this you're always writing all the time, and coming up with ideas all the time, because that's what you do, it's what you enjoy. And you're hanging out together socially as well and standing in a room, making music together. "And then all of a sudden we were like, oh, we've got a bunch of songs here, we should go into the studio and record them. "There's no particular narrative or theme between the five songs. "Obviously, because I write some of the lyrics, some of them are quite heartfelt and personal to me, but also they can be interpreted by anybody in their own way. "Some of them started out as songs on an acoustic guitar and some of them started out as full-on jams. "Essentially it was like, we've got seven or eight ideas here that are really good, let's try and tighten them up to make five ideas; have a word with Pete, the producer, and see if he is up for recording them, which he was. "We spent a long time doing the demos. Our friend Rachael has a barn up in Brindle, so we recorded some of the drums up there for the demos. We recorded a lot of the vocals and guitars in Andy's kitchen, like you would. And then we sent the finished demos to Pete and it was like great, come down. And he's got everything. He's got this beautiful barn studio down in Devon and it's residential. So we spent a few days there just recording everything live. It's great." After a start steeped in sadness, Seamus was keen to describe his favourite memories of being involved with the band. "Obviously the show's that we've played so far have been brilliant. "But for all of us it just means an awful lot to be in a band with people that we really respect and like. "It's the friendships that we have formed outside of the band and the fans that we've met. "I've always believed that making music with others is better than making it on your own - it's quite a lonely process. But making it with this bunch of guys - that's my favourite thing - even the little fall-outs we've had, which aren't very many because they're not that kind of people. It's just the general vibe around making music with this band that really gives us all a kick." If you aren't able to catch them at 53 Degrees, you can head to Manchester on Sunday, June 24 when they will be playing at Jimmy's, with support from Tio Rico and The Masons.